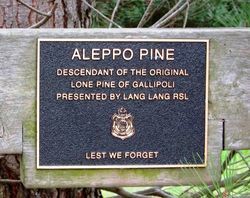 The Aleppo Pine commemorates those who served in World War One. 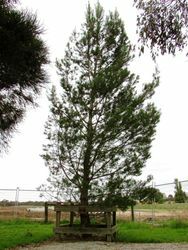 Funding was received through the Anzac Centenary Grants Program to construct a walkway to the pine tree. The Gallipoli “Lone Pine” has become a piece of living history in Australia. Every Australian soldier who served at Gallipoli knew Plateau 400 or “Lone Pine”– the scene of some of the fiercest hand-to-hand combat by Australians in World War I. The Plateau was distinguished by a solitary pine which bore silent witness to the heroism and tenacity of Australians who fought there. Lone Pine was a heavily fortified Turkish trench position, identified by a solitary Pinus Halepensis species Brutia commonly known as an “Aleppo Pine”.